The 2019 season is under way, we are stocked up with plenty of racing parts to rebuild and keep your race cars running from race to race and safety equipment for the driver and team. We ship orders daily! Best of luck for a Great Season! We have a lot of things going on that we would like to tell you about! Check back often, we are always updating and adding new products. If you don't see something, please ask. If we don't have something in stock we can get most items in 2 days! We don't wait for stock orders, you can count on us to place your orders and get your parts to you when you need them! 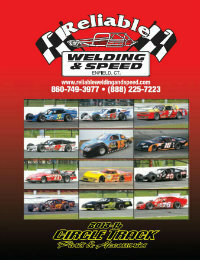 Most Saturday’s we will be open till Noon (but we may be closed on a Saturday occasionally) – you can call us first to check at 1-860-749-3977 or 1-888-225-RACE. We have added many new items to our online store and we are continually adding more and more items, so please be sure to visit often. We will be sending informational emails regularly highlighting some of the different racecar parts and equipment we keep in stock, so if you haven't already, please be sure to sign up for our newsletter on the main page. Also you can request a catalog on our Catalog request page! If you are placing an order and need a Catalogue - please make a note when you process your order so we can include one with your order.